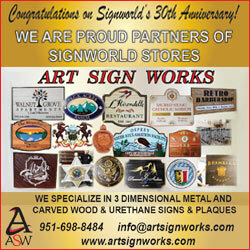 There are some striking differences between Signworld and a standard franchise. Signworld has a one-time buy in fee, eliminating the usual royalties associated with a franchise. This one-time payment gives them lifetime support, including full support to their children should they decide to enter the business at a later time. Signworld provides as much training as other franchise offerings including an annual conference and trade show; weekly sales classes; mastermind groups and weekly product, pricing and technical webinars. Signworld owners, giving it an additional level of training than they would normally get. they have the ability to work regional and national accounts through their own contacts. Signworld encourages the premise that "if you name it – you own it." area interests them the best. more is achievable and its scalable to your ability” Werner says. its owners and their success, Signworld will thrive and expand,” closes Werner.